KIEV, Ukraine -- The European Union is ready for compromises with Ukraine in all matters except democratic freedoms, EU Enlargement Commissioner, Stefan Fuele, has stated. 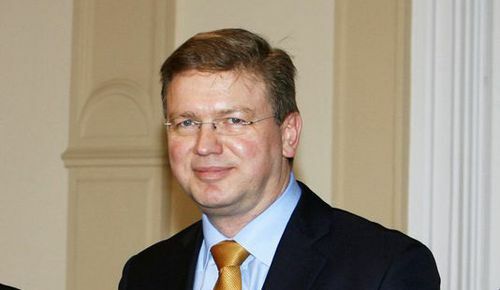 EU Enlargement Commissioner, Stefan Fuele. Such words from an EU official, who is viewed as friendly in Kyiv, confirmed that the condition of democracy after Viktor Yanukovych’s February election as president may spoil Ukraine’s European integration. Even without this factor, talks on an association agreement and free trade with the EU have been difficult. The October 31 local elections, which the opposition claims will not be fair, will be a serious test for Kyiv ahead of the Ukraine-EU summit scheduled for November 22. The recent reversal of the 2004-2006 constitutional reform by Yanukovych, a reform which had been among the main achievements of the pro-democratic 2004 Orange Revolution, alerted Europe to the fact that democracy is in danger in Ukraine. Yanukovych went out of his way to dispel this concern in personal meetings and telephone conversations with the leaders of the UK, France and Germany, as well as EU officials in early October. For example, he told UK Prime Minister, David Cameron, that he was “interested more than anyone that the [election] processes in Ukraine should be transparent and democratic and that the principle of the rule of law should be observed”. Nonetheless, the Parliamentary Assembly of the Council of Europe (PACE), the European human rights watchdog, adopted a tough resolution on democracy in Ukraine on October 5. PACE warned that the consolidation of power by the presidency should not lead to the monopolization of power by Yanukovych’s party. PACE opined that the current political stability in Ukraine is fragile and that the government has been implementing reforms “in a hasty manner.” PACE denounced “pressure on journalists and party and civil society activists and their relatives” by the security service and expressed its concern over reports of possible electoral fraud ahead of the local elections. An unabashed Yanukovych, addressing French scholars and businessmen in Paris, reaffirmed Kyiv’s bid to join the EU. Moreover, “Ukraine has the right to expect more from the EU,” Yanukovych suggested. The European Parliament (EP) unlike PACE decided to adopt its own resolution on Ukraine after the October 31 local elections. Following heated debates on October 20, in which European leftists opposed the center right’s intention to take a tough line on Kyiv, the EP limited itself to hearing a statement authored by Fuele and EU foreign policy chief, Catherine Ashton. The statement, while praising recent economic reforms and political stability in Ukraine, expressed concern at reports of the “deterioration in respect for fundamental freedoms and democratic principles” in Ukraine. The foreign ministry hailed the EP’s decision as “a victory of common sense” and expressed hope that EP would eventually pass “a balanced resolution”. A tough resolution may spoil the November 22 summit in Brussels for Ukraine. Even without that, Kyiv will not achieve at the summit as much as it hoped. Prime Minister, Mykola Azarov, speaking in Brussels on October 13, admitted that a free trade agreement would not be signed on November 22, and a week later he said the agreement would not be signed this year. Azarov and Yanukovych had hoped that the document would be signed this year, but talks with the EU have been difficult. Speaking to the Russian government news agency RIA Novosti on October 25, Azarov noted that Ukraine is more interested in compromises than the EU, given the fact that the EU accounts for 30 percent of Ukraine’s foreign trade, while the share of Ukraine in the EU’s trade is only around 1 percent. Ukrainian Deputy Economy Minister, Valery Pyatnytsky, in an interview with Zerkalo Nedeli on October 16 listed the most difficult issues in the trade talks. These are, EU sanitary norms which Ukraine has been slow to adopt; the EU’s reluctance to open its energy and transportation markets; the EU’s unwillingness to either lower import duties or increase agricultural import quotas; and Ukraine’s reluctance to remove export duties on agricultural commodities. The situation is exacerbated by the EU’s suspicions that Ukraine may opt in favor of the customs union of Russia, Belarus and Kazakhstan. The Ukrainian foreign ministry tried to dispel these suspicions, saying in a statement on October 12 that Ukraine had no intention of joining the customs union. Pyatnytsky noted in the interview that membership of the EU and of the customs union would be mutually exclusive goals. Free travel is an issue on which Kyiv may progress at the summit. For its part, Ukraine cancelled visa requirements for EU citizens in 2005. A readmission treaty aimed to combat illegal migration was concluded with the EU in 2008, and Ukraine is ready to make biometric passports as required by the EU, so Kyiv believes it is up to the EU to adopt a political decision on free travel for Ukrainians. However, another problem which is played down by Kyiv is the existence of a transparent border with Russia. Consequently, much will depend on the outcome of visa talks between Brussels and Moscow.